An armored vehicle drives past members of the press after an operation against militants who took hostages at a restaurant popular with foreigners in Dhaka, Bangladesh, Saturday, July 2, 2016. Bangladesh authorities deployed heavy security throughout the capital Saturday following an 11-hour standoff with a group of militants who killed 20 mostly foreign civilians at an upscale restaurant. Security forces rescued at least 13 hostages during the siege. Most of those who died were Italian and Japanese nationals. At least two police officers were also killed. Italian Prime Minister Matteo Renzi confirmed Saturday that Italians were among the victims of the Dhaka attack, but would not give details or numbers until families had been notified. Authorities in Japan confirmed the death of seven Japanese nationals. The White House and the U.S. State Department confirmed the death of an American but had not released his identity as of Saturday afternoon. Both also condemned the attack and said the U.S. stood with Bangladesh and was resolved to confront terror wherever it occurs. In a televised address to the nation Saturday, Bangladeshi Prime Minister Sheikh Hasina said that her country would not let "conspirators succeed in their mission" to tarnish its image. She appealed to all citizens of Bangladesh to "come forward and help fight terrorism." Sheikh Hasina also addressed those "driven towards the path of wrongdoing" and demanded that they "stop killing people in the name of Islam," which she stressed was a peace-loving religion. In an interview with VOA's Urdu service, Kamal Hassan, a former foreign minister and law minister of Bangladesh, said that terrorism has nothing to do with religion, therefore Islamic State is not representative of Islam or the Muslim world. He said that on the domestic front, one political party should not blame another on security threats but everyone should do some soul-searching and come up with solutions to help the country. He said terrorists were targeting a harmonious society. Hassan said that not only Bangladesh but the whole world should adopt a unified policy to deal with terrorist groups like Islamic State and al-Qaida. The siege ended when security forces stormed the building, killing six attackers and capturing one. Most of the victims were hacked to death, and their killers sent photographs of the carnage to the Islamic State during the standoff. Islamic State claimed responsibility for the attack, but the identity of the attackers has not been confirmed. Gunfire and explosions were heard Saturday morning after scores of commandos converged on the restaurant, more than 10 hours after the hostage crisis began. Journalists were not allowed near the restaurant, where several armored vehicles were on the scene. 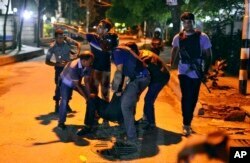 The attack began late Friday when as many as 10 gunmen entered the Holey Artisan Bakery, located in the diplomatic zone of Dhaka. People help an unidentified injured person after a group of gunmen attacked a restaurant popular with foreigners in the Bangladeshi capital Dhaka. Police initially cordoned off the area around the restaurant and exchanged gunfire with the attackers, who set off explosives. By midnight, shooting around the restaurant appeared to have stopped. Police then tried to open a channel of communication with the militants. Several hours later, the commando operation to free the hostages began. A bakery employee who escaped the attack told reporters the gunmen shouted "Allahu Akbar" ("God is great") prior to taking hostages. Some people in the restaurant were able to escape through the roof. Lori Ann Walsh Imdad, principal of the American Standard School in Dhaka, lives one block from the restaurant and described the scene to VOA. "I started hearing the shots outside. ... Then I started very cautiously looking out of my balcony to see what was going on, but you could really hear the shots in the distance, and could see people running around." She said that by 12:30 a.m. local time, the streets were quiet, although she said there was still a large police presence. State Department spokesman John Kirby said all Americans working at the U.S. mission in Dhaka had been accounted for. Bangladesh has seen a series of attacks in recent months, mostly targeting secular bloggers, atheists and religious minorities. The Islamic State terror group and al-Qaida in the Indian Subcontinent, or AQIS, have claimed responsibility for many of the attacks. Al-Qaida leader Ayman al-Zawahiri announced the formation of the group on the Indian subcontinent in 2014, and Umar has appeared in al-Qaida publications as the leader of the Indian offshoot. Umar is believed to be based in Pakistan but was born in the mid-1970s in India. Bangladesh authorities have largely rejected the claim that foreign terror groups are behind the attacks. Instead, top officials have blamed the attacks on the political opposition or local militant groups. VOA’s Urdu service, Maaz Hussain and Isabela Cocoli in Washington contributed to this report.